Esta experiencia se ofrece en español y será traducido al inglés cuando/si es necesario. Mándanos un mensaje usando nuestro enlace de contacto para informarte sobre nuestras opciones de traducción. Our Oaxacan chocolate host, Flor, is opening the doors to her family’s small chocolatiering business and to generations of expertise in the industry with this scrumptious experience with Oaxacan chocolate. We invite you to step inside! This experience has been one of our most popular and widely-appreciated amongst locals and visitors alike! This experience includes a brief introduction to the cacao plant and a run-through of the notable roles it has played throughout pre-hispanic, colonial, and modern-day history. We´ll also delve into the significance of this delicious drink during modern day celebrations. 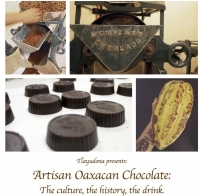 We’ll learn a bit about multiple varieties and the differences in appearance and flavour amongst Oaxacan chocolate, and then delve into the journey from plant to delectable treat. Flor will explain how her family creates artisan chocolate in their local factory, and then we will duplicate the process by hand in their recently-opened storefront location. We’ll shape our own artisan chocolate to take home, where we can later prepare an amazing cup of hot chocolate unique to Oaxaca and true to its roots in each step of its production. But have no fear—we wouldn’t expect you to wait until you get home to eat some chocolate! During Flor´s presentation, you´ll get to taste the various ways that chocolate has been prepared throughout Mexico´s rich history. And while our handmade chocolate tablets cool, we’ll take advantage of the time by tasting El Rito’s most popular varieties: bittersweet milk-chocolate, semi-sweet, chocolate with nuts, and vanilla-flavored chocolate. My mouth is watering just thinking about it. Flor’s family founded “El Rito”, a local business dedicated to Oaxaca’s tradition of manufacturing fine-quality drinking chocolate with local ingredients. They share Tlayudona’s commitment to fair business practice and valuing local producers, workers, and processes in each step of their operations. Their base ingredients are purchased locally and processed in a small plant on the outskirts of Oaxaca, so their ecological footprint is naturally quite low. Characteristic of our generation, Flor is taking innovative steps to move forward creatively within the world of artisan chocolate so that her family´s business will remain a player in the local scene. Come check it out, learn some things, and get your chocolate on! Come visit us at Tlayudona and pay upfront in cash to receive a 10% discount. Children age 8 are welcome to participate with their parents. You can also check out our Children´s Day of the Dead Chocolate Experience. Reservation required, due to the confines of the space. Maximum 6 participants, so reserve your spot with anticipation! ¡Ven a echarle un vistazo, aprende algo nuevo y llévate tu chocolate a casa! 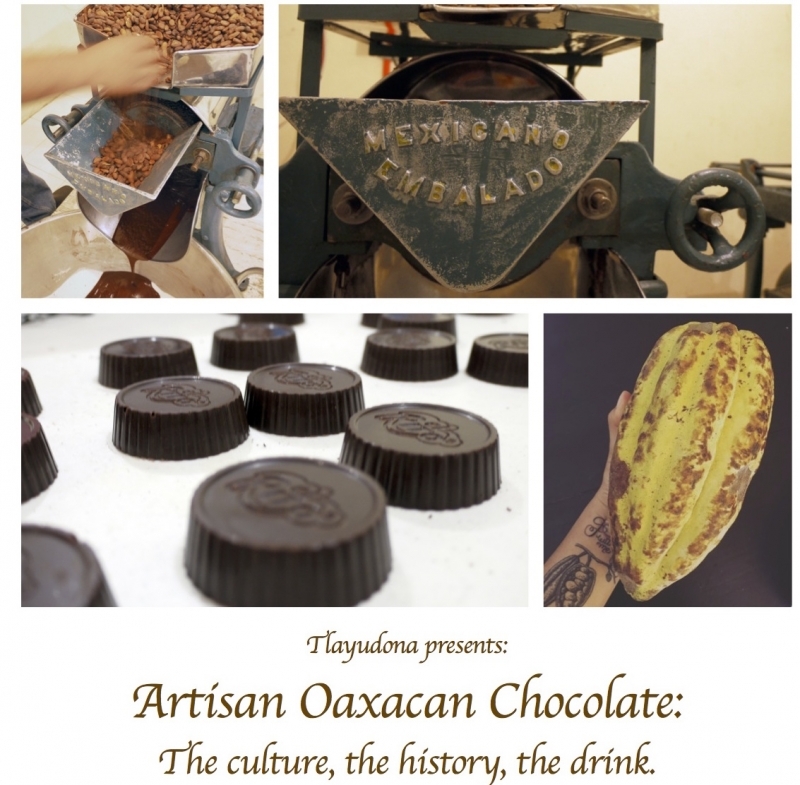 Una introducción al chocolate artesanal, dentro del contexto oaxaqueño. Una breve discusión sobre la historia de la planta de cacao y su valor histórico en distintos periodos. Catación de por lo menos cuatro distintas variedades de chocolate que “El Rito” ha preparado para ti. Aproximadamente 150g de chocolate para que te lleves a casa y lo conviertas en deliciosas tazas de chocolate caliente. Visítanos en Tlayudona y paga por adelantado en efectivo para recibir un 10% de descuento. Niñxs de más de 8 años son bienvenidos para participar juntxs con sus madres/padres. Reservación obligatoria, debe al tamaño del sitio. Máximo 6 participantes, entonces aparta tu lugar con anticipación.